The Olot Artistic Skating Club, sponsored by Pop Rocks®, will rock the coming Reus Championship 2014 with a technique and choreography that will surprise everybody. On Saturday, at 7 pm, fans will enjoy a great show in the Reus Olympic Local Pavilion, with all tickets already sold out. The World Championship favourite teams are the three Catalan teams: Olot, Masnou and the home team, Reus. 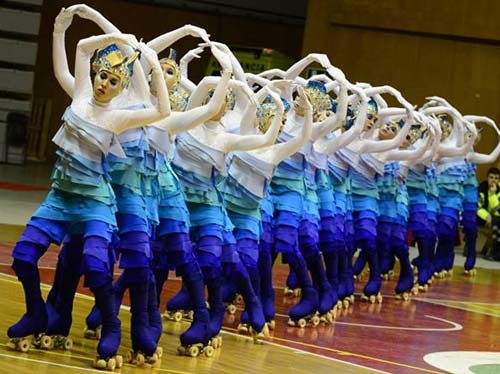 At this time the Olot Artistic Skating Club, sponsored by Zeta Espacial S.A., is the favourite with their new choreography “BREATHE”, that will compete for the Gold Medal to revalidate the current qualification as the World Champion 2014 in the Shows category. If they win, this would be their eighth championship and their 100th podium since they started competing internationally. Last year, their show “NOTHING IS IMPOSSIBLE”, a metaphor of life, gave them the glory. This year Ricard Planiol (team´s coach) and his team are ready to surprise us again with an aquatic world, transforming the group into a fish’s shoal that moves beneath water at all times and only comes up to surface for some oxygen, to breathe. The Pop Rocks® team and all fans of the Olot Artistic Skating Club, wish them the best of luck. At the same time we also wish the best luck to the rest of the teams,… and the best team win!